EDITOR’S NOTE: Updated August 2017 to clarify the Aldi mouthwash scene. Aldi’s non-food Regular Buy section includes many of the things that you’d see in a larger grocery store, including a decent selection of personal hygiene products. Part of that stock includes dental hygiene. Here we’ll take a look at some of the things Aldi stocks (and doesn’t stock) to keep your teeth clean and your breath fresh. When it comes to toothbrushes, Aldi offers one Regular Buy that we’re aware of: the Dentiguard Pro Plus Toothbrush. 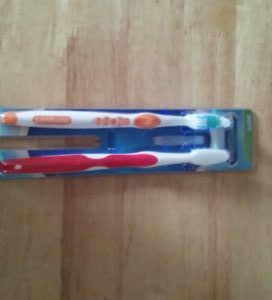 This is a serviceable, if unspectacular, toothbrush. The bristles are contoured a lot like more expensive toothbrushes, with longer and shorter bristles to help better get into the gum line. Other than that, though, it’s pretty no frills. The Pro Plus comes in both soft and medium bristles, and most dentists recommend going with soft. Occasionally, Aldi also offers a few different Special Buy electric toothbrushes. One is the Dentiguard Power Toothbrush. 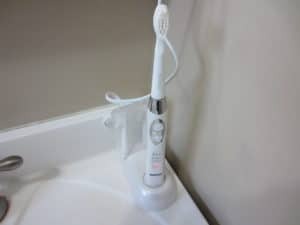 We have extensive experience with the toothbrush, and while it did a good job for us in keeping our teeth and gums clean, one of ours stopped working after about six months of use. Another consideration: this model runs on AA batteries and can drain them quickly, so we suggest high power lithium batteries. 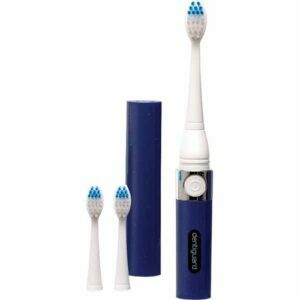 The Power Toothbrush comes with a year’s worth of brush head refills, available in soft or medium. As we said earlier, most dentists recommend soft. 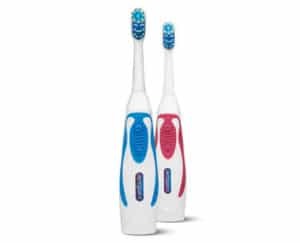 Another Special Buy is the Dentiguard Rechargeable Sonic Toothbrush. It comes with 8 heads and runs about $20. We’ve tried it out and found it to be a decent imitation of much more expensive models. Still another Special Buy is the Dentiguard Travel Sonic Toothbrush. It comes with heads that look somewhat like the regular sonic toothbrush, although they are not interchangeable. We’ve looked at it, and so far, so good. We haven’t spotted any kids’ toothbrushes to date. Aldi doesn’t offer any house brand toothpaste options. Instead, the Aldi stores in our area carry a couple of different Crest products: at the time of this post, they had one with tartar control plus whitening, and one with whitening plus Scope. The prices, as far as we can tell, are about on par with other stores. 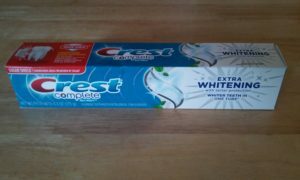 We’ve tried the Crest Complete With Extra Whitening — it’s got a nice minty taste and seems to do the job both with tartar and with whitening. Conspicuously, Aldi doesn’t any sell dental floss … or, at least, we’ve never seen it, despite Aldi themselves advertising dental floss as part of the Dentiguard line. This is surprising, even for a low-inventory grocery store, and we figure it would be fairly straightforward to either secure generic floss or bring in a name brand. To be fair, some research now suggests the benefits of floss are unproven, but most dentists still strongly recommend using it. Mouthwash comes in a few broad categories: antiseptic, antibacterial, and anticavity. The first two protect the gums against things like gingivitis, while the third protects teeth and enamel from cavities. Because of the way they operate, a mouthwash cannot be anticavity and antiseptic/antibacterial at the same time. Aldi does not carry an anticavity mouthwash that we’re aware of, but it does carry at least one antiseptic and one antibacterial. 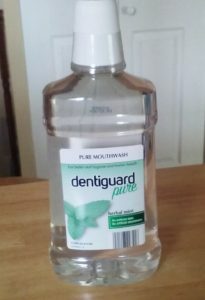 The antiseptic is Dentiguard Pure Mouthwash, an in-house brand, which we found after lamenting the absence of an Aldi mouthwash. This Aldi mouthwash is … okay. The ingredients are that of your basic antiseptic mouthwash, including alcohol, and the taste is fine. It has a lower alcohol content than Listerine, though, so if you’re concerned about gum disease, you might want something stronger. Our stores also offer a brand-name mouthwash, and — as with toothpaste, it bears the Crest name. Of late, we’ve seen Crest Pro Health mouthwash, which is an alcohol-free antibacterial mouthwash. It’s somewhat more expensive than the Dentiguard. The dental hygiene scene at Aldi is a mixed bag. We like the fact that Aldi has at least a couple of options on the toothbrush, toothpaste, and mouthwash fronts, although some of those options are better than others. The Regular Buy toothbrushes and mouthwash, for example, tend to be rather basic, while the toothpaste, while solid, are name-brand and thus not as cheap. Dental floss is missing entirely, at least from our local stores. Overall, Aldi provides some Regular Buy basics — and even a few Special Buy frills — but there’s no doubt in our minds that this is a part of the store that could be better.